When I interviewed Real Pickles’ Dan Rosenberg last year, he could only taunt me with mouth-watering descriptions of his garlic dill pickle. I’d tried and enjoyed everything else he produced (such as sauerkraut, kimchi, tomatillo hot sauce), but he simply wasn’t able to satisfy my hunger for his garlic-infused pickles. It was early in the spring, and the pickle-maker had run out. It may seem odd for a pickle producer to run out of inventory. Isn’t the whole idea of making pickles in the first place to keep the crispy cukes around forever? If you answered “damn right” (or some equivalent) to the above rhetorical question, chances are you’re under 60 and, sad to say, may have never eaten a real pickle. Fake pickles, like the ones on the shelves of your favorite supermarket, may well be around forever, but they’re not real pickles. It’s a common misunderstanding. These days when you say something’s “pickled,” you either mean it’s very drunk—referring to biological samples preserved in jars of alcohol—or in a state of suspended preservation, as with vegetables crammed into jars of vinegar. Real pickling involves neither alcohol nor vinegar: just the vegetable, water and a little salt. While a real pickled cucumber will last many months longer than one that’s not pickled, the real pickling process is not about stasis. It’s about transformation. Instead of nothing happening, as in a jar of fake pickles, microbiology is going on inside a jar of Real Pickles. Fermentation. The creation of new flavors. Exciting stuff. As a result, he had enough produce to try a new product, Real Pickles’ Spicy Dill Pickles (as usual, very tasty, and much fierier than their Tomatillo Hot Tauce), and he could also prepare an abundance of his Garlic Dills—enough to last until next season, he estimates, and enough to box some jars up and send them off to the Good Food awards earlier this year. Based in San Francisco, the Good Food awards celebrate artisanal foods from across the country that are made with organic ingredients in an environmentally sound way. 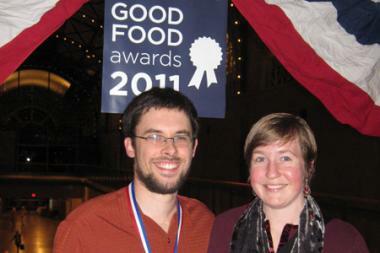 Categories include beer, charcuterie, cheese, chocolate coffee, pickles and preserves. This was the first year for the contest, which was organized by the Seedlings Project, a group devoted to promoting sustainable food production and whose executive director, Sarah Weiner, has worked closely with members of the Slow Food movement and restaurateur Alice Waters. From around 780 entries, 70 winners were selected. In the pickling category, there were approximately 80 entrants but only 12 winners. Real Pickles’ Garlic Dills were (most deservedly) on that list. Rosenberg and his partner Addie Holland traveled out in January to receive their award. While they were delighted to be honored in such a way, Rosenberg said an equal joy was meeting other like-minded picklers. Being that there are only a handful of people across America making pickles with traditional methods, it was a unique experience having so many of them at one table. Some of these people were new to Rosenberg, but the Wisconsin farmer who won for his purple sauerkraut was someone who had taken one of Rosenberg’s pickling classes. The picklers all received their awards from renowned fermentation revivalist Sandor Katz. Real Pickles buys its pickles from Chamutka Farm in Whately and Atlas Farm in Deerfield. Its garlic comes from Old Friends Farm in Amherst, and the dill is from Riverland Farm in Sunderland.